Before the age of computers, designers and artists work merely by hand. This shows a great deal of creativity and originality since these will never be replicated in any other way. That is why original artworks by famous artists have high value. Even handmade artworks are more expensive because it isn’t just one’s artistic value that is given regard but also his intelligence, imagination, skill and the story behind it. An artwork is part of an artists’ soul. Every output is done by heart. An artwork comes in various types and we get to see them every day online. This could include photographs, traditional art and digital creations. But of course, works that are done by hand are still there. We came across one impressive artist who could create impressive letterings and murals from his hand’s strokes and his mind’s creativity. All these are done with the magic touch of his brush and his pen. One look at it would make you think that the murals are wall decals or wall stickers. But they aren’t. They were done by hand. We are talking about a young illustrator and designer from London, Tobias Hall. Hall is a 25 years old freelance illustrator, letterer, designer and mural artist who started working for his love of art after he graduated in Summer 2010. 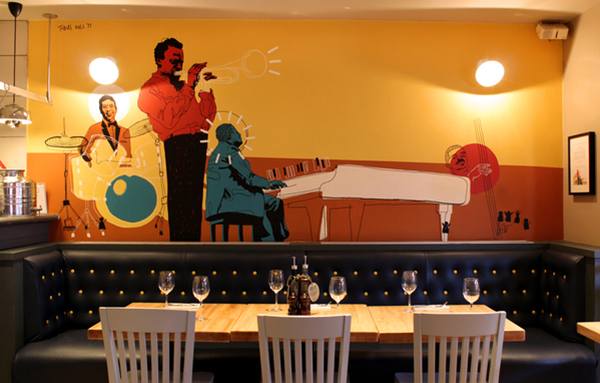 He is an in-house illustrator, art director and designer of a UK-based Italian restaurant chain Zizzi which paved the way to the exposure of his brilliant works. Since then, he gained recognition not just in the online world but also in the real world as he garner a growing number of international clients. We were privileged to shot a few questions for Hall despite his hectic work schedule. Naldz: How did you start working on typography? And what’s your favorite work that you’ve ever created? Tobias: I only really started taking a serious interest in typography a couple of years ago. Since then I’ve been lucky enough to work on lots of interesting project, which has given me the opportunity to get better – hopefully that will continue! Naldz: We can see that you have good typography work. 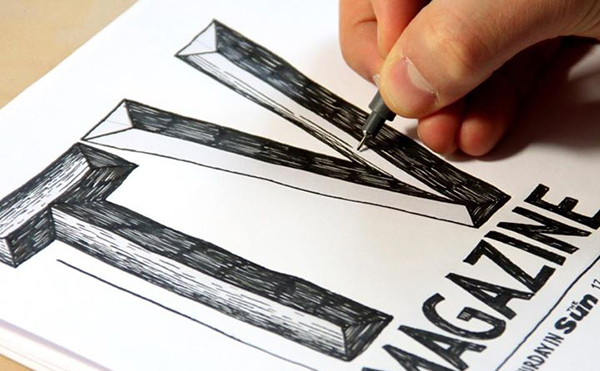 What are the things that you consider important in order to come up with a good lettering? Tobias: That’s a tough one! 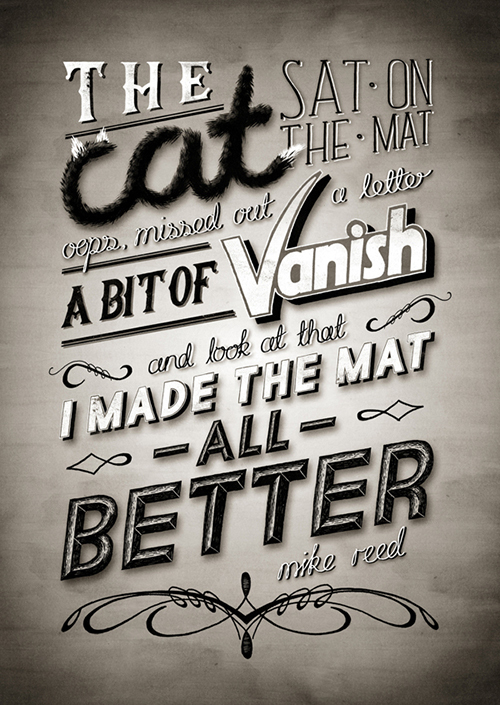 I think there are so many different styles of lettering that each need different qualities in order to be successful. For example, ‘playful’ letterforms need to have good energy and flow to them, whereas I find vintage letterforms look nice when you include a high level of detail in them. It’s also always very important to match the lettering style you choose with the brief you’re working on. Naldz: Can you give us a brief walk through on your work flow? Tobias: I usually start by drawing up a quick scamp, to get an idea of proportions and how I’m going to achieve emphasis on certain words/lines. Then I’ll start drawing words in pencil on various bits of A3, before finally going over them in pigment liner and scanning them in to Photoshop, correcting any issues with spacing etc. and adding colour. Finally I’ll add shadow, texture and tone to the piece. Naldz: Are all your works hand-drawn or you also use computer software/ application to enhance them? What is your favorite medium? 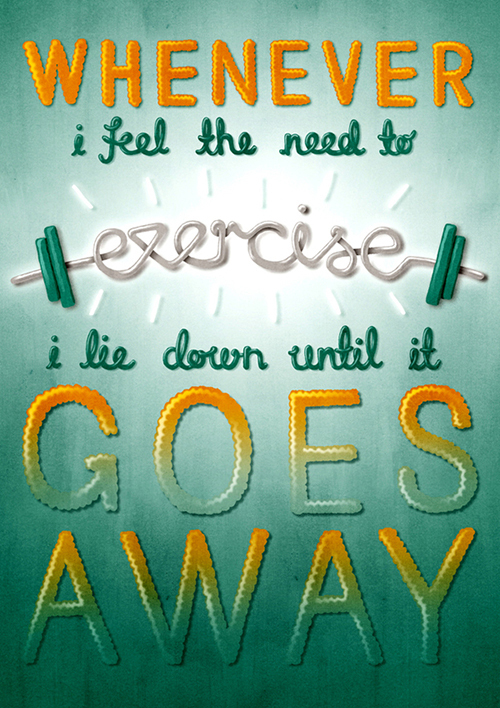 Tobias: At the moment all of my lettering work is hand drawn, but I certainly want to start using Adobe Illustrator more in the future, so that I can take that approach when I feel it’s needed. Naldz: Where do you gather most of the inspiration for your works? Tobias: I have a book called ‘A visual history of Typefaces and Graphic Styles’, which I always look through when I’m starting a new piece. 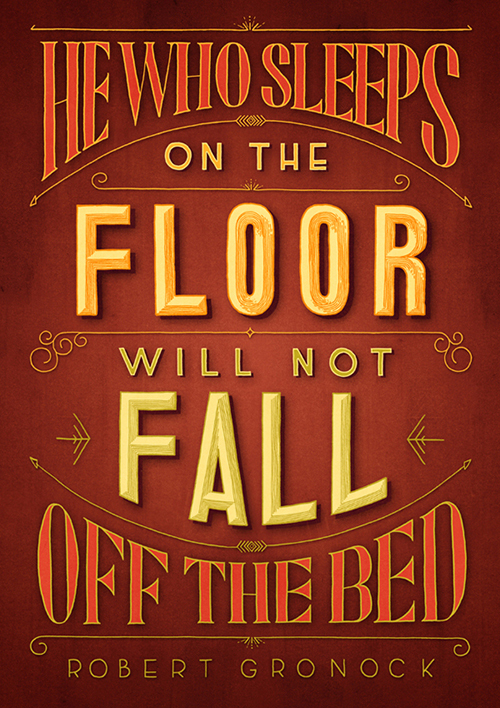 There are so many different vintage styles of lettering in there, which always gives me ideas. I also look around websites like Behance.net, where there are many number of amazing typographers to learn from. Naldz: What else do you do aside from lettering? Tobias: I’m also an illustrator and a designer, besides working in-house for a restaurant chain here in the UK as their art director and designer. You can see all of my work at my portfolio. Naldz: What is your advice to aspiring artists? Keep getting better and show your work to as many people as possible! 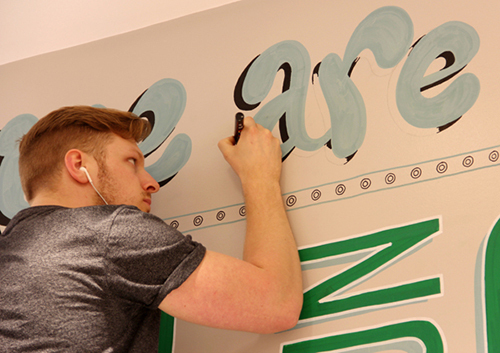 The latest mural done by Hall is the wall mural for Holiday Inn in Camden, London. The idea came up because music is a vital part of Camben’s local culture especially being the origin of Britpop music. 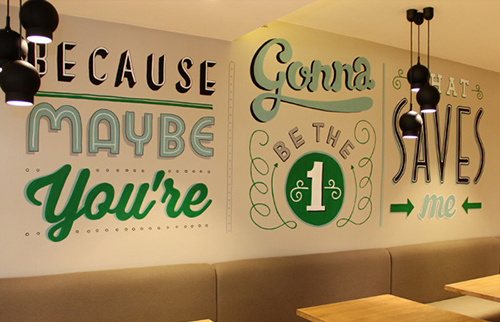 Song lyrics from well-known songs and that could be associated to the place were painted on the wall. 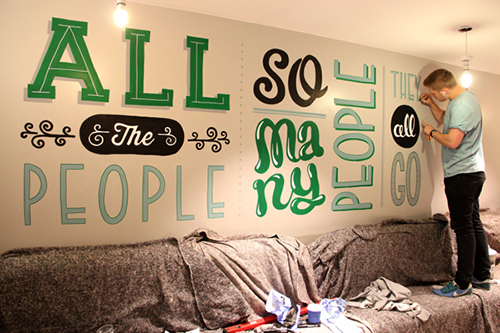 Hall have chosen lyrics from three well known Britpop songs and painted them in playful bespoke lettering. The lines from a song that you can see in this image would tell clients of Holiday Inn that they would “feel alright” while seeing their friends here. Hall did a great job in this wall mural! With very sharp and clean details for the letters. 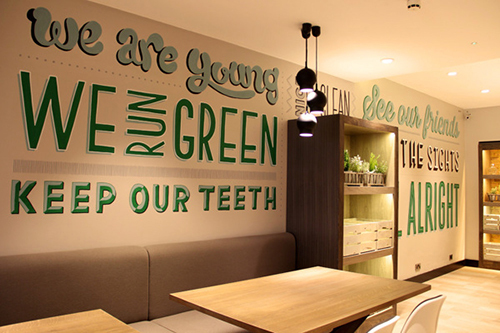 Aside from the mural in Holiday Inn, Hall also did other wall murals that was not limited to typography but also allowed Hall to create illustrations which is one thing he loves to do. 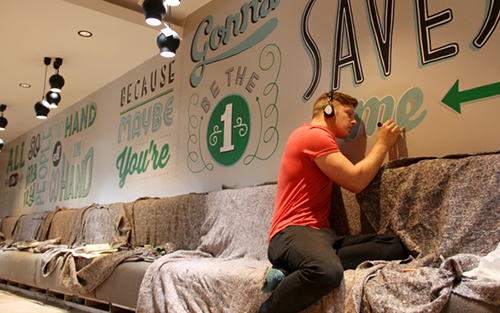 Take a look at what he did for Zizzi Restaurants and you can also see more of his murals in the video. The color used here is gray but the painting is playful! 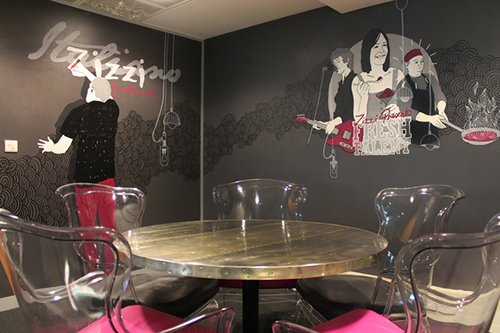 A wonderfully done mural that will surely make us want to sing and love music even more while dining in Zizzi. 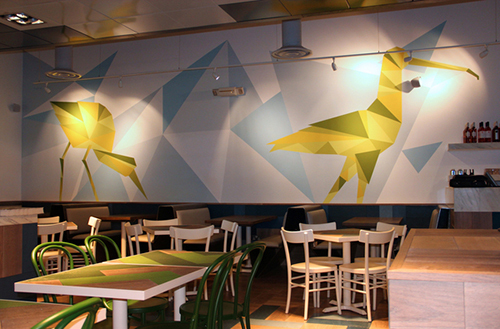 These mosaic birds add a modern touch to this place. The combination of colors were well done, too! Hall still have a lot more great stuff to show us. 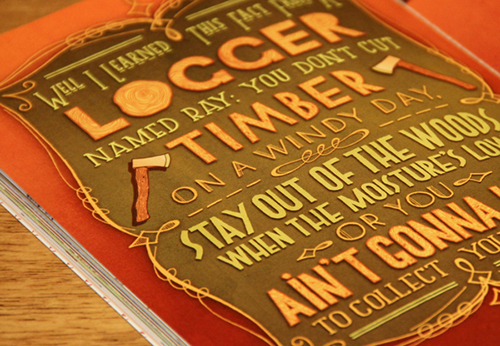 We have here a brief showcase of some of his letterings where you can see his talent in playing with typography. Try to observe how Hall can give personality to his letterings. Aside from wall murals and letterings, Tobias Hall also work on illustrations. His latest drawings were self-initiated portraits of musicians. Hall’s works is one way of expressing not just his love for arts but also for music. His works also remind us that art can come out superbly with one’s golden hands and not just through digitally generated outputs. So, if you want to see more of Hall’s works, you can check his website and Facebook Page. Well,this is a good insight for us..thanks! I like the advice of Tobias Hall,it’s simple but it’s sounds motivating and encouraging. Thank you for featuring this interview Ronald it’s very helpful. And I notice that this a new post,nice idea! !keep it up. Base on his video,his a PROFESSIONAL!! I love your new article,thanks for featuring this. How did you do this interview,via phone or personal? 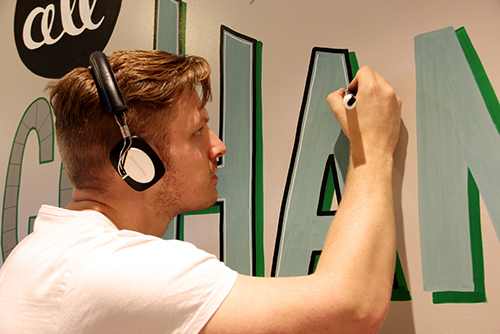 His really a great artist in terms of lettering and murals,it is really shown here. I like his video but it’s done so fast so the essence of his greatness of being an artist become unremarkable. I like this so I’m looking forward for more post like this. A lots of information here.